Midas of South Florida :: New Transmissions Explained! Tiptronic... Shiftronic... Geartronic... What’s it all about?!? Don’t worry we’ll explain it. Tiptronic is a type of discrete automatic transmission developed by Porsche and used in its vehicles and those of its licensees. A Tiptronic transmission can operate just as a typical automatic transmission, but it also allows the driver to override the automatic mode by moving the shift lever into a second (Tiptronic) shift gate equipped with two spring–loaded positions, which equate to "upshift" and "downshift". Once in this gate, the driver takes over most of the shifting decisions ordinarily performed by the transmission’s computer, permitting, for example, the delaying of an downshift for increased acceleration or to increase the braking effect of the engine. On some cars, the upshift and downshift operations can also be commanded by pushbuttons or rocker switches installed on the steering wheel with an optional display in the instrument panel indicating the current gear selection. Though Tiptronic transmissions the driver is allow a certain measure of discrete control, the Tiptronic design is implemented using a torque converter like other automatic transmissions. A Tiptronic is not a computer controlled clutch–manual transmission or semi–automatic transmission. Most Tiptronic implementations still make some shifts automatically, primarily to protect the engine and transmission. For example, as used by Audi, a five–speed Tiptronic will make the upshifts from 1 to 2 automatically when moving off from a stop even when in Tiptronic mode; the transmission then waits for the user’s upshift command before proceeding from 2 to 3, 3 to 4 and 4 to 5, although the transmission will still upshift if the redline is approached. On deceleration, the transmission will make all downshifts automatically to avoid running the engine at too–low an RPM although the user can accelerate any downshift (that would not violate the redline), thus allowing improved engine braking or preparation for future acceleration. There are some exceptions to this; the system used in the Aston Martin DB9 is designed to hold the gear at the engine’s redline, though it will still downshift automatically. This system also allows the engine to blip the throttle during downshifts for a sportier drive. Most luxury vehicles with a Tiptronic transmission have two fully–automatic modes: One, identified as “Comfort“ or similar, and another, usually called “Sport,“ which delays upshifts for a sportier driving at the expense of fuel, wear, comfort, and noise. Then, within each major mode there are additional hidden modes selected by the transmission itself; these modes adapt to the demands being placed upon the car by the driver. In this way, shift quality has been improved due to better electronic controls; these electronics modify the shift points to adapt to a given operator’s driving style. Volkswagen equipped with paddle shifters. Some makers such as Aston Martin and BMW offer paddle shifters behind the steering wheel for controlling their similar transmissions. Some systems such as Toyota SMT and Volkswagen’s DSG are different from Tiptronic transmissions in that they are actually based on sequential transmisions but have an electronically controlled clutch (or in Audi’s case, two clutches). 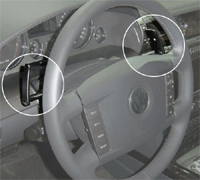 These are generally not referred to as Tiptronics but are considered to be true semi–automatic transmissions. Tiptronic® is a registered trademark, and it is owned by German sports car maker Porsche, who licenses it for use by others such as Volkswagen, Audi and Skoda.